Though Cuba ranks 134th in the world in vehicles per capita—only thirty-eight per every one thousand residents, just ahead of Tajikistan—the automobile has become emblematic of this island nation’s turbulent history over the last seventy years. Following the revolution, the United States halted all auto exports to Cuba, a move Fidel Castro embraced by famously declaring, “We need tractors, not Cadillacs!” Time effectively stood still on the streets of Havana, as mechanics found ingenious ways of resuscitating ’57 Chevys by swapping out V-8s for Soviet diesel engines. Today, about one in six cars is an American classic from the fifties—the vast majority are improvised Ladas and Fiats, leftovers from the Cold War. Now that a ban on foreign auto imports has been lifted, a new era is beginning for Cuban drivers, but the price of globalization may still prove to be an insurmountable barrier. 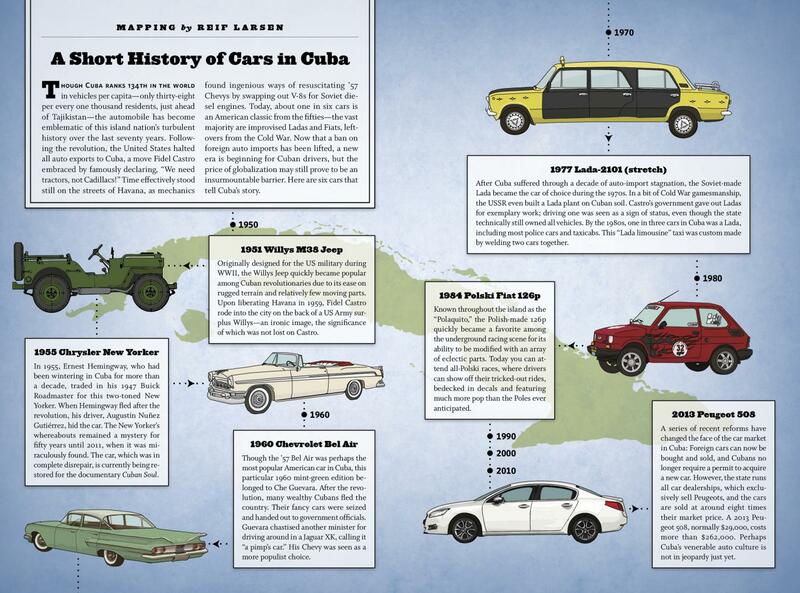 Here are six cars that tell Cuba’s story. In 1955, Ernest Hemingway, who had been wintering in Cuba for more than a decade, traded in his 1947 Buick Roadmaster for this two-toned New Yorker. When Hemingway fled after the revolution, his driver, Augustín Nuñez Gutiérrez, hid the car. The New Yorker’s whereabouts remained a mystery for fifty years until 2011, when it was miraculously found. The car, which was in complete disrepair, is currently being restored for the documentary Cuban Soul. Originally designed for the US military during WWII, the Willys Jeep quickly became popular among Cuban revolutionaries due to its ease on rugged terrain and relatively few moving parts. Upon liberating Havana in 1959, Fidel Castro rode into the city on the back of a US Army surplus Willys—an ironic image, the significance of which was not lost on Castro. Though the ’57 Bel Air was perhaps the most popular American car in Cuba, this particular 1960 mint-green edition belonged to Che Guevara. After the revolution, many wealthy Cubans fled the country. Their fancy cars were seized and handed out to government officials. Guevara chastised another minister for driving around in a Jaguar XK, calling it “a pimp’s car.” His Chevy was seen as a more populist choice. Known throughout the island as the “Polaquito,” the Polish-made 126p quickly became a favorite among the underground racing scene for its ability to be modified with an array of eclectic parts. Today you can attend all-Polski races, where drivers can show off their tricked-out rides, bedecked in decals and featuring much more pop than the Poles ever anticipated. After Cuba suffered through a decade of auto-import stagnation, the Soviet-made Lada became the car of choice during the 1970s. In a bit of Cold War gamesmanship, the USSR even built a Lada plant on Cuban soil. Castro’s government gave out Ladas for exemplary work; driving one was seen as a sign of status, even though the state technically still owned all vehicles. By the 1980s, one in three cars in Cuba was a Lada, including most police cars and taxicabs. This “Lada limousine” taxi was custom made by welding two cars together. A series of recent reforms have changed the face of the car market in Cuba: Foreign cars can now be bought and sold, and Cubans no longer require a permit to acquire a new car. However, the state runs all car dealerships, which exclusively sell Peugeots, and the cars are sold at around eight times their market price. A 2013 Peugeot 508, normally $29,000, costs more than $262,000. Perhaps Cuba’s venerable auto culture is not in jeopardy just yet. I'm really sorry but the information about how the Willy M38 was popular among the revolutionaries is not accurate. It is true that the Willy was used by the American army in WWII. The American army was the Cuban Army's supplier before the revolution for that reason the Willy was one of the main military vehicles on the Island. During the war between the Cuban army and the revolutionaries, the rebels didn't have any transportation and seized the captured army vehicles, among them was the famous Willy. So the main reason they had it is bacause was the only thing that they could have and was free.